There are people we come across in our life time that leave different impressions or marks in our lives. But there are those who have a lasting impact that alters your thinking, your perspective and possibly your life in a positive way. I’ve had a few of those kind of people in my life. Maybe I’m more impressionable than most people, but I know when someone’s sincerity is genuine. Call it a gift or discernment, but whatever the case might be, I can tell. My Great Uncle, Ramon (Abuela’s brother), has been one of those people who has left me enriched every time I get to spend time with him. It’s not often, primarily because he has lived far from me all my life but no doubt the time spent with him has been valuable. There is something about how he tells stories of the past, his facial expressions, body language and that special tone in his voice. I immediately become connected to the past, our ancestors, who at one time all lived together in a big piece of land with different rooms within that sparse parcel. To this day, some of the property in Purepero, MIchoacan, is still in tact, and with some of the same rooms still standing. There is also something about the way he seems not to be paying attention, gazing into the distance during a conversation at times; but you can count on him to laugh at your silliness and jokes with impeccable timing. Maybe that’s it–He makes it easy for me to be me to be silly even “si me paso“. He doesn’t shut me down or notices my defects. He embraces me, Silvia, as odd as I can be. For the greater portion of his life, my Great Uncle Ramon, has lived in Purepero, Michoacan (where Abuela is from). Almost annually, I would travel there and would stay at his house. I always felt welcomed by him and his wife, Marica, whom I also have great respect for. I looked forward to those trips and anticipated spending much time just sitting around with the family. I enjoyed my time there, especially with the older generation. I would just sit and talk about everything with them. Sometimes, I would just sit and watch novelas for hours at a time, just to hear and see their reactions. I got to meet my bisabuelos (Abuela’s Parents), and many other of abuela’s siblings and uncles. It was the best of times. Even as a kid, I knew how important it was to get to know them all. I wanted to somehow keep their memories engraved with in me. Today, that land, (those little rooms on the plot located along Calle Cinco de Mayo) are no longer lived in. The family that is still in Mexico, gather there to spend time together weekly, but is not a residence to anyone, according to my uncle. 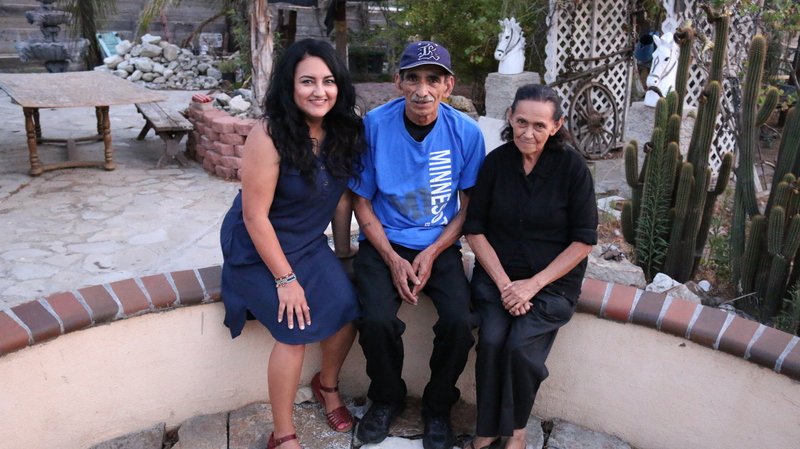 The last time I was there, my uncle Ramon and his wife Marica were still living there–no more kids were at home, each one with their own family, no longer living in the same property. I remember walking around on my last visit, I could still hear faint voices in my imagination, and the stories by those whom once inhabited the area. 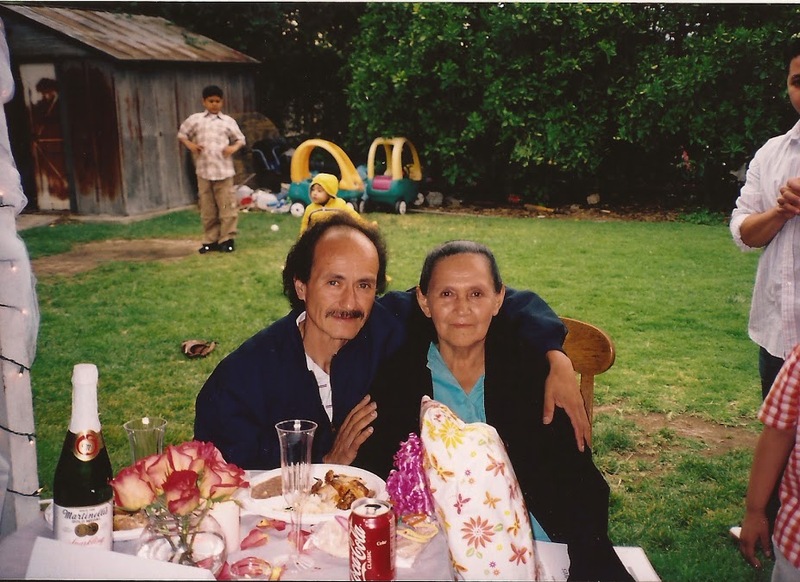 I could see my Aunt Licho (Abuela’s sister), sitting in the corner she loved to sit in, I could imagine me pushing her around in her wheelchair, sometimes scaring her because I pushed her too fast. I could imagine the times where I was allowed to grind the corn in a “metate” which I’m sure was just for fun. I was very small to remember what we did with the corn but old enough to have the memory of it. I could imagine my walks to the “cerro” to shoot my great-great grand-father’s gun from the “Revolucion” to then watch my uncle Ramon shoot a rabbit for dinner. As a teen we would take those same walks to reach the top of the “cerro” just to sit, look down at the town and talk about life. There is no way to reenact those experiences pero los llevo en mi memoria y corazon. They are experiences that have left an impression in my life and will remain with me until the day I die. I feel so blessed and thankful to have been enriched greatly by those experiences. That’s why I enjoy my uncle Ramon’s visits. They connect me to those old stories, to the family that has past, and to the experiences that have left a lasting impression within me. I was so thankful to have been able to spend these few days with him and my Abuela, together. It helped Abuela greatly during this hard time to have her only living brother with her. I loved to see her light up as they told their stories of old together. It was great to see her laugh (even despite the pain of her recent loss), and for that I am grateful. Today, my uncle Ramon leaves back to Minnesota. It was hard to say good bye to him, it always is. I can only imagine how Abuela might feel to see her brother leave. I don’t care how poor a man is, if he has family, he is rich. Today, I feel like the richest woman on the planet. Most of us wish to live long lives. In our 20s, we want to live long enough to meet our significant other. Years later, we would want only to live long enough to meet our unborn children. As we pass that rite of passage, we then hope to live long enough to meet our unborn grand children. We live hopeful, because life bring many unexpected events. Many people have had the privilege of reaching those marvelous milestones and have even surpassed them by getting to meet great-grandchildren. As awesome as that is, it also seems like the longer you live, the more loss or pain you experience. My Abuela will be turning 81 this coming September. She has seen so many births and she has also experienced many deaths. A few days ago we lost my uncle Jose (one of my Abuela’s sons), the one many of you were praying for. Being that we are a close family, we all took a big hit, especially his wife, children and Abuela herself. She loved him so much and we all knew that. She worked so hard these past few months, during the peak moments of his illness, to make sure he had all he needed. Recently, my uncle Jose craved all sorts of foods and Abuela was so faithful to make sure that anything he craved, she would cook for him. And with his passing, a piece of her heart as a mother…has also left. I’m so grateful that my aunts suggested we gather at his house this past 4th of July. Our annual 4th of July Celebration usually consists of hanging out at my “Abuela’s” house. We all would gather at her house around sunset; each family would bring their own stash of fireworks and we would all sit around to watch everyone light up the sky with all the colors of the rainbow. We would sit around talk and laugh, as we munched on chips, papas con pollo (made by my Tio Manuel) and all sorts of junk food. But this year, the “Aunts” of the family decided that we should all gather at my uncle Jose’s house and so we did. Somehow we all felt that it might be my uncles last 4th of July. But we never would have guessed that it was going to be his last full day of life. This 4th of July, we had a great time with my uncle, laughing, eating, lighting up the sky and just talking. July 5th at around 11:00pm, my Uncle Jose Contreras slipped away very gently with his wife, 3 kids, Abuela and some family by his bed side. As heart broken as Abuela is, she was thinking about all of you today. She wanted me let you all know why we will not be uploading videos for an undetermined amount of time. We would like to thank you for your on-going support and encouragement. If you are able, please keep Abuela and our family in your prayers. To help the family with memorial costs, click on either of the links below.